Talk about your rare bird alert. For now, the bird is roosting at a warehouse in Springfield. 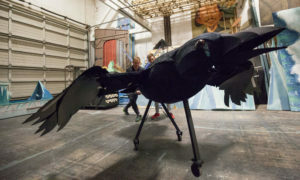 This week, dancers Mark Tucker and Isaac Jones took time to test the mechanical crow, which has an 11-foot wingspan and levers to control its beak and wings. Next month’s production will feature the debut of Portland composer Kenji Bunch’s original score as well as original sets, costumes and choreography. Artistic Director Toni Pimble chose scenes for the full-length program that would advance the story and translate well to ballet. In Andersen’s fairytale, the young heroine, Gerda, must rescue the little boy she loves, Kay, from the cold-hearted Snow Queen. 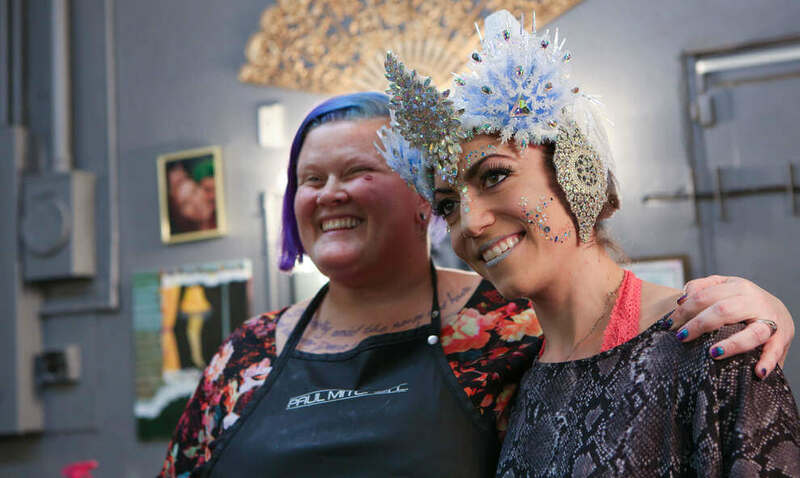 Pimble included crows — the giant prop as well as dancers costumed in black feathers, sequins and jeweled headdresses — to help Gerda on her journey. Dancing the role of Gerda, Yuki Beppu will ride the crow, which — spoiler alert — falls prey to a band of ruffians. “The Snow Queen” runs April 8-9 at the Hult Center for the Performing Arts. Tickets are available at hultcenter.org.